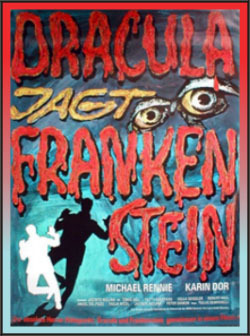 (1969, aka DRACULA VS. FRANKENSTEIN) Michael Rennie, Karin Dor, Paul Naschy. Rennie is an alien mad scientist whose race is out to conquer Earth. From a castle in Transylvania he revives legendary monsters to help him carry out this insane scheme. Frankenstein, Dracula, the Wolfman, and the Mummy all star. Don't confuse this with the Sam Sherman/Al Adamson drive-in classic of the same name!